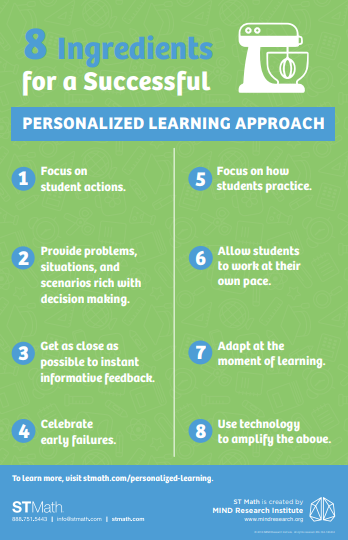 Personalized learning has been defined different ways, depending on the context, connection to pedagogy and technology, and even between different educational institutions. Through research, practice, and shared experienced from education leaders, there are elements that have proven effective in personalized learning models. These elements can help provide a foundation for a school or district designing their own approach. Personalized learning environments enable each student to explore and develop their own pathway to mastery. By providing problems, situations, and scenarios rich with decision making and immediate informative feedback, student actions drive the learning. When learning is truly personalized, all students are equipped to reach the highest levels of achievement, regardless of where they started or their pace of learning. Technology. What is the tech doing that’s really going to help learning outcomes? Customizing to styles of learning or preferences. Research has debunked the learning styles myth. Adaptivity. Adaptivity tells the computer to choose - it’s placement. How is the tool personalized at the moment that decisions are being made? Rewinding. If you didn’t get it the first time, is getting the same information the same way going to help? If I got a hint, what decision did I make to get this hint as opposed to another? Or do all decisions get the same hint? The antithesis of one size fits all. The goal is that all students can learn in a deep and meaningful way. Sometimes in trying to become the antithesis of "one size fits all," we create the antithesis for personalized learning. Choosing what you get to learn. Personalized learning requires that learning actually is happening. In the moment that a student gets “stuck”, that's the moment where learning is happening. Just holding an innovative viewpoint. We must move beyond that mindset to innovative actions that give students new opportunities to learn. A new concept. The concept of personalized learning has been around, but we now have the opportunity to dive even deeper into what personalized learning can be. Listen to "Personalized Learning Misconceptions" on Spreaker. Focus on student actions. Learning by doing, not learning from instruction. Provide problems, situations, and scenarios rich with decision making. Even early predictions are valuable. Get as close as possible to instant informative feedback. Inform the student on why they succeeded or what they can revise. Celebrate early failures. A failure learned from is a success. Focus on how students practice. Deliberate practice is a transferable skill. Allow students to work at their own pace. A fixed amount of instruction time before moving on can minimize learning. Adapt at the moment of learning. Placing or customizing to styles or preferences doesn’t guarantee learning. Use technology to amplify the above. Technology can improve learning, not just scale content. Is the technology providing an active or passive learning experience? Is the technology offering personalization, or merely customization? Is the technology offering a learning experience, or a practice experience? What are the ingredients of true personalized learning? What kind of experience are you looking to provide for your students? Classrooms in the US range from 20-30 students per teacher. It is not feasible to expect each teacher to handcraft an individualized learning plan for each of their students. This is where technology can support the teacher. Technology does not replace the teacher, but provides feedback in a scalable yet individualized way. Teachers cannot be beside every student for every decision. But technology can provide personalized feedback for each decision a student makes, depending on their decision. Teachers are free to facilitate deeper learning through questioning and guiding students’ line of thinking. Or use data from the tool to pull groups of students who need targeted assistance with a particular item. Technology can allow students to take ownership of their learning. Technology has the capacity to show data and analytics based on the student’s progress in real time. This encourages students to create their own goals and continue learning for the sake of learning, cultivating intrinsic motivation. Examples and insights from education leaders who’ve implemented personalized learning with successful student learning outcomes. ST Math is a visual instructional program that builds a deep conceptual understanding of math through rigorous learning and creative problem solving to engage, motivate and challenge PreK-8 students toward higher achievement. In ST Math, over 200 visual games create a unique pathway of interconnected content challenges to provide differentiated instruction for individual students, regardless of skill level. Students take their own path to mastery. In order to move to new levels, they must demonstrate mastery at each stage of the objective. To ensure all students develop deep mathematical understanding, the program personalizes their exposure to each concept according to their unique needs. As a result, students are empowered to work through any obstacle as they make their own pathway to mastery. Enter your email and we'll send the Personalized Learning Resource Kit your way! Copyright © 2019 MIND Research Institute. All rights reserved.